Jon is local to Haliburton Highlands, having lived here his whole life. He is committed to the Haliburton community and engaged in a variety of local organizations. Jon started installing solar and wind jobs in 2009 and immediately found a passion for it. He works at Haliburton Solar and Wind as head of projects on a variety of installs from net metering, off-grid, and GridZero. 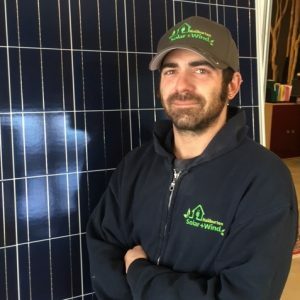 As part of his commitment to stay current with the ever-changing technical aspects of the solar industry, Jon has completed and earned certificates in highly regarded courses such as; PV101, offered by Solar Energy International, and Solar PV Design and Installation, from Canadian Solar Institute. As Jon works directly on the job site, he has a Commercial Vehicle Operator and Defensive Driving Course with AZ License, Certificate of Dangerous Goods Training, Working At Heights, Ladders Training, Canadian Red Cross First Responder & CPR/AED Level HCP, and Apparatus Maintenance.